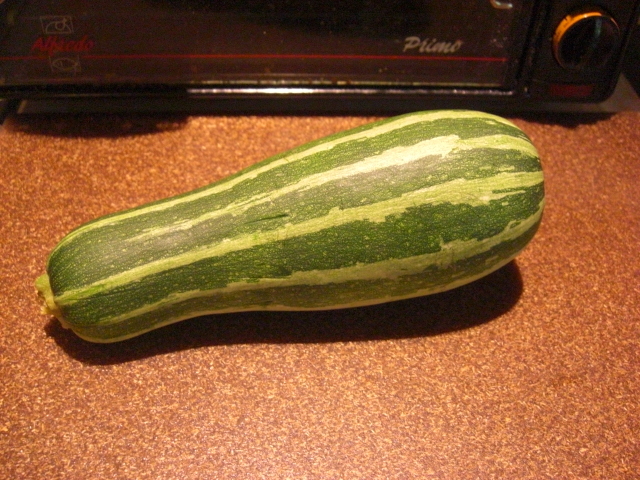 Zucchini that looks like watermelon. Cut into an “apple” and find a pit. 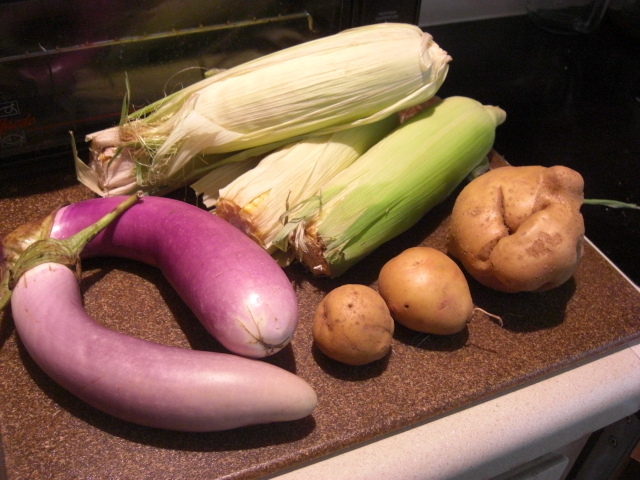 Here’s the gorgeous and occasionally curious produce I got this week. The combination of watermelon, sweet onion, feta cheese, mint, and vinaigrette makes a perfect summer side dish. I’ve also read you can sub in other melons like cantaloupe and honeydew for the watermelon, but I haven’t tried that yet. I will say that this salad is best eaten the same day. If you have more melon than you can eat in a meal, just keep the ingredients separate and mix them before the next serving. 7/14 Lychees, sprite melon, and sausage! Sorry about the delayed post this week. Especially because there’s so much cool stuff to talk about. 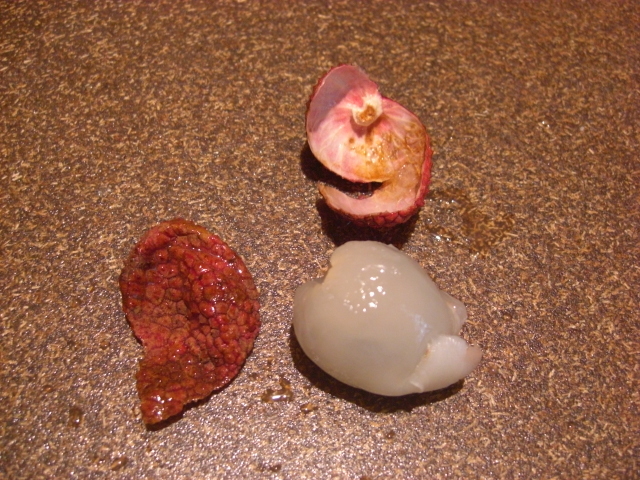 Lychees are cool! The peel is papery and very different from the soft insides. We couldn’t agree on what lychees taste like. Chris thought they were very sweet. James said they reminded him of sugary grapefruit. I thought they tasted a little like honey and rose, but then I’d been primed from reading a bunch of descriptions. 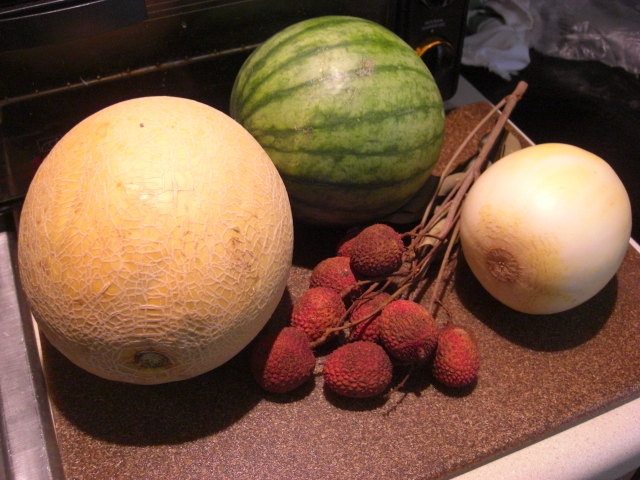 Here’s a site with tons of lychee recipes. I’m torn between making a syrup and mixing it with seltzer for afternoon sodas. Or baking them with brown sugar, butter and cinnamon as suggested here. The good news is lychees will keep well in the crisper for a couple of weeks, so I don’t have to decide today. The ambrosia melon is a muskmelon and kind of like cantaloupe. You can tell it’s an ambrosia melon from the netted skin. I’m pretty sure the smaller melon is a sprite melon. It sounds like my kind of melon – sweet and crisp. Here’s more about sprite melons at Wikipedia. Yesterday we made our watermelon into Watermelon Salad with Mint Leaves. It’s a great recipe, and this is the second week in a row we’ve made it. Basically it’s watermelon, sliced Vidalias, feta cheese, and mint tossed in a vinaigrette. 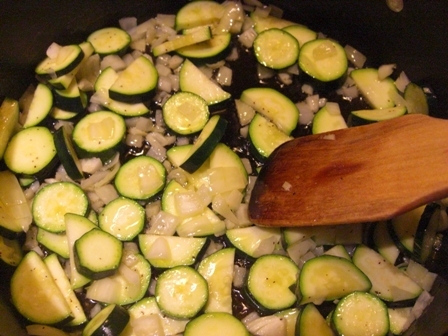 It really works and makes a perfect summertime side dish. 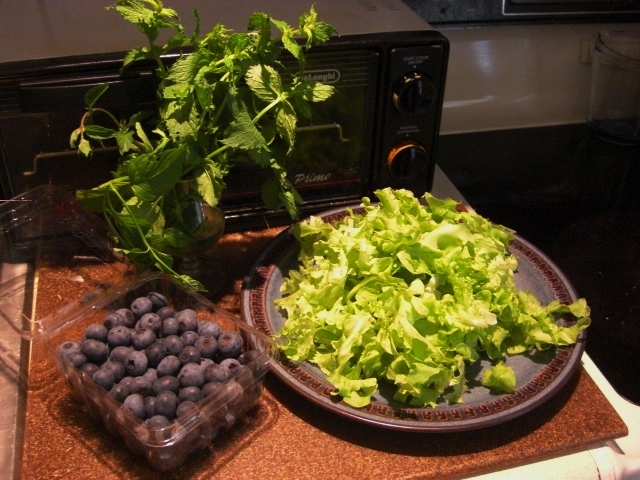 The lettuce and blueberries are delicious as usual. The mint was great to have for the watermelon salad. Plus, last night, when I pulled the mint bouquet out to make a pot of tea, I found a few stems twisty-tied together. 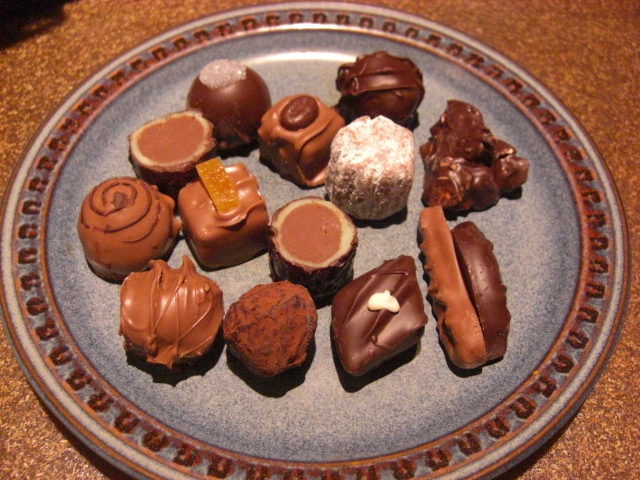 Turns out they were Fran’s patented stevia and chocolate mint combination. They made a wonderful pot of tea. And here are some ideas for eggplant from last year. 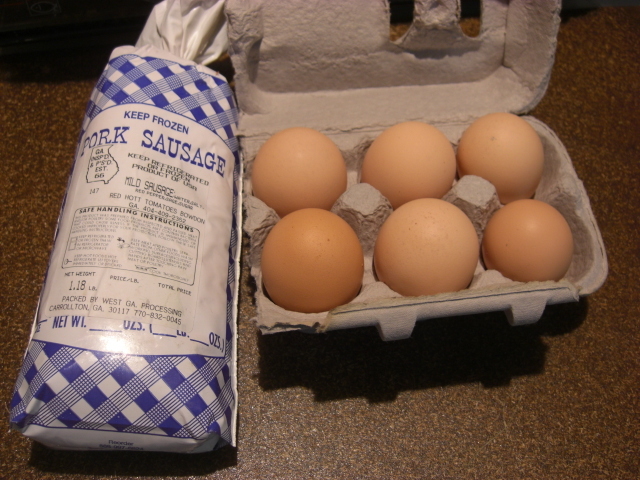 This sausage from Nancy and Jacque at Red Hott Tomatoes is delicious! It’s got great flavor and texture. It’s almost a delicate sausage, if that makes any sense. 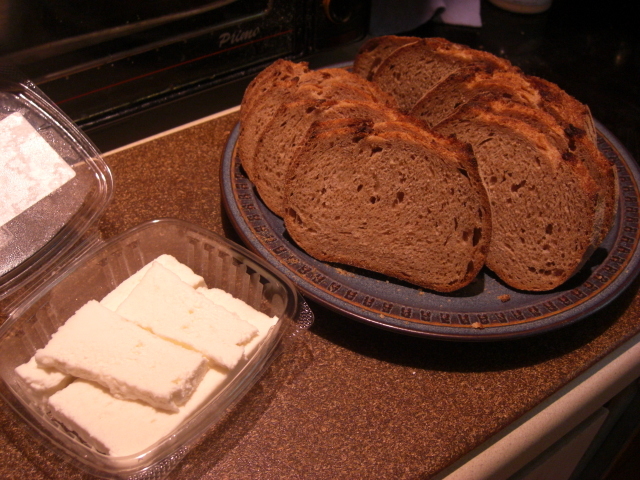 I’m lucky in the sense that foods don’t usually call my name from inside the refrigerator – except for Flat Creek Lodge cheese. The cheddar is incredibly complex with hints of bleu at the end. I love it! I could sit down on the kitchen floor and very happily eat the entire package. 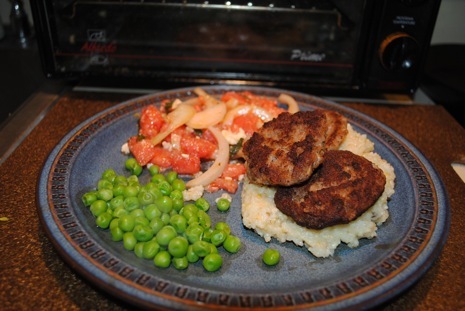 For lunch yesterday, we had sausage and grits with watermelon salad and peas. 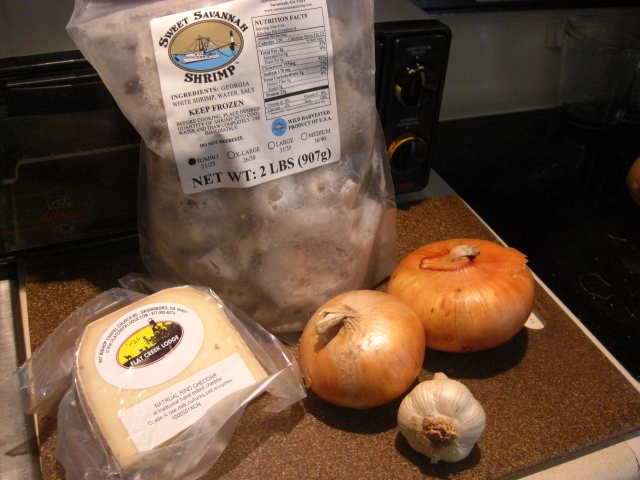 The grits were from Riverview Farms and leftover from a CSA delivery earlier this year. The peas were from the frozen vegetable aisle at Kroger. 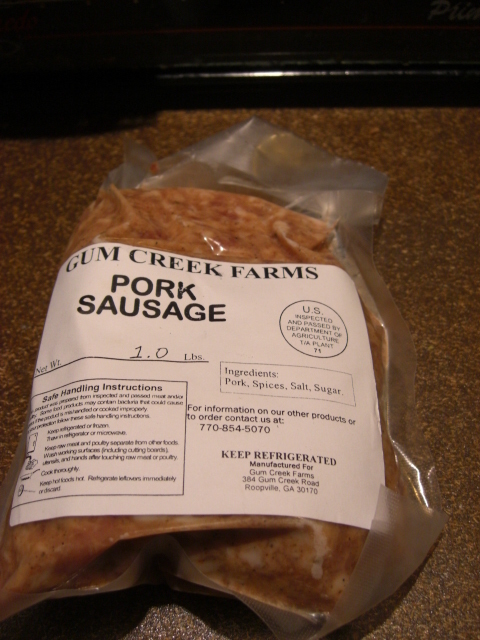 I stopped off at the Powder Springs Farmers’ Market yesterday. Scored some great stuff. I think I shorted him a quarter, but that’s okay because I’m going back next week for more. 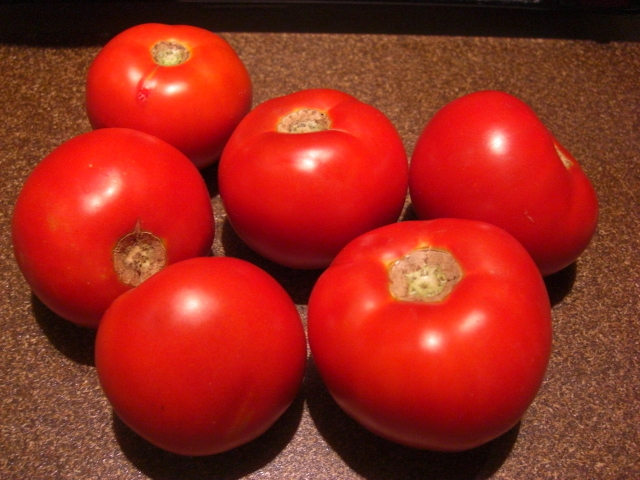 While these tomatoes might not have the striking charisma of heirlooms, they are meaty and full of flavor. Even got me thinking about canning. I also talked with a farmer from Loganville. (Whose name I did not get either. Hopefully, he’ll be there next week, too, and I can report it then.) This farmer’s in his twenties and clearly devoted to his work. I love talking to and buying from people like this because it reminds me that I’m helping make farming a viable career choice for intelligent, passionate people. Every professional sometimes feels his or her work is the most important work. (“I’m not selling used cars, man; I’m providing transportation and opportunity.”) It’s a natural and essential egotism that keeps us going. But farmers are right. 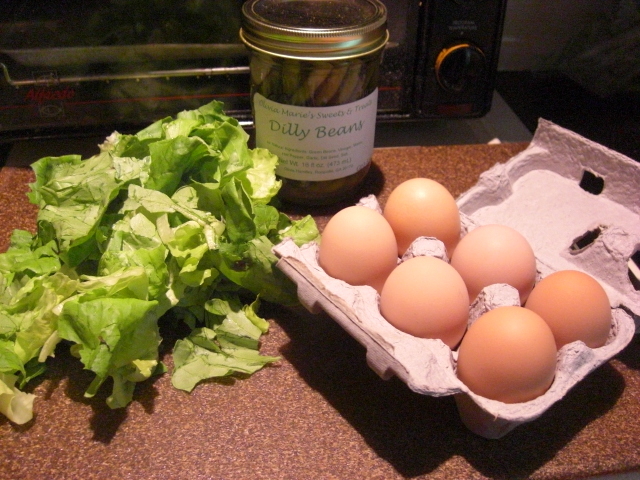 One of the fun things about sticking with a CSA is that every year is different. My first year was the Year of the Eggplant. This year has been all about the fruit. And here are the items I ordered from the online store. 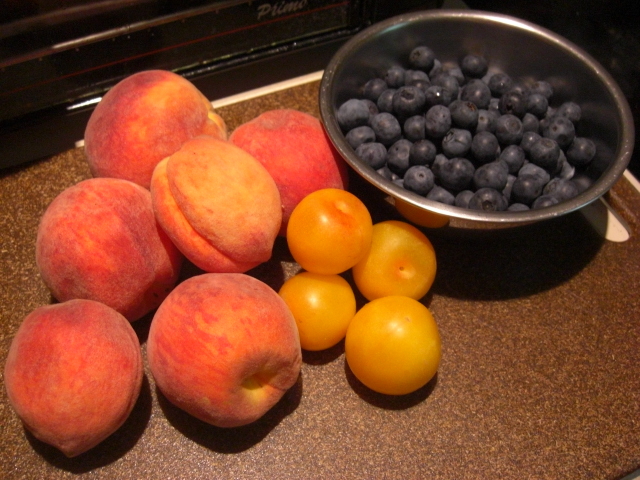 When we’re getting this much fruit, it can’t all become baked goods. So this week I’m trying to find recipes that use fruit in other ways. For instance, I’m planning stir-fried shrimp and Chinese cabbage with plum sauce. I don’t have all the recipes pulled together yet, but here’s one plum sauce recipe that looks interesting. The Chinese cabbage is from a few weeks ago, but it’s still holding up. I’m determined to finish it this week. This recipe for raspberry spoonbread from delish.com sounded yummy. I’m thinking about trying a half recipe with the blueberries. Another option is this blueberry-bourbon barbecue sauce. 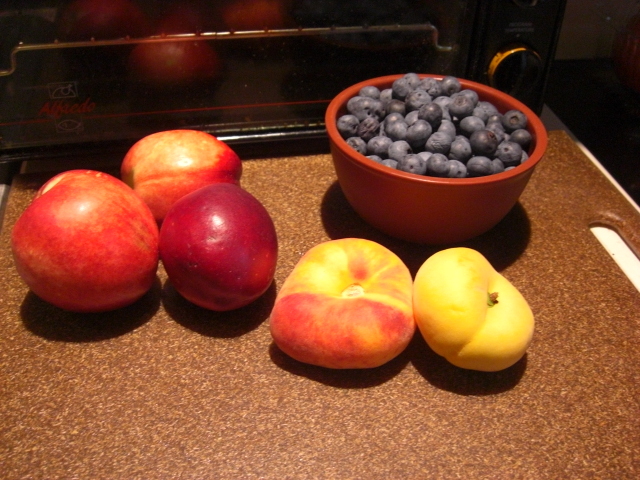 The peaches need to ripen a few more days, so I have time to decide what to do with them. The default plan is to chop and freeze them for muffins or cobbler later. 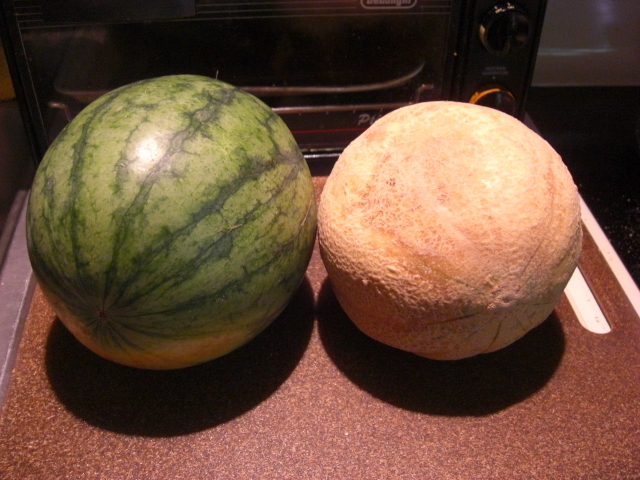 The melons we will slice up and eat. 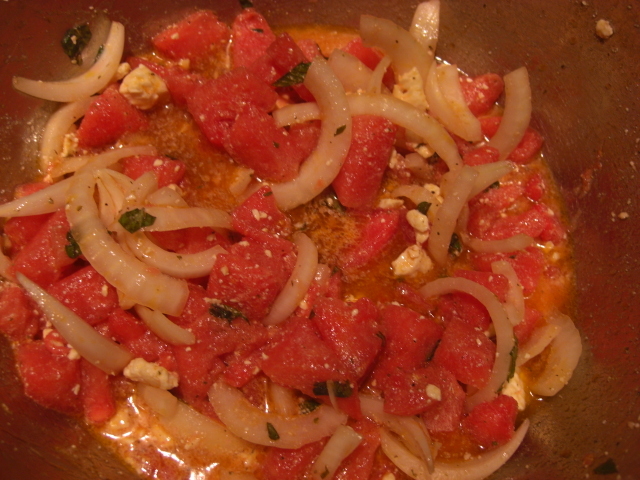 I may try Paula Deen’s watermelon salad with the Vidalia onions and feta cheese. Melon chunks can also be frozen for later. I’d like to cook down the tomatoes like I’ve been doing the past couple of weeks, but I may encounter objections from family members who like fresh tomatoes. 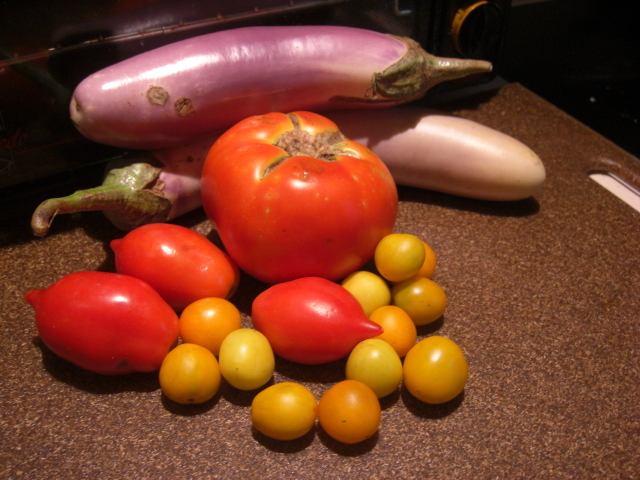 Chris said one of the little reddish tomatoes was so sweet that it tasted like a grape. The rattlesnake green beans are tasty. 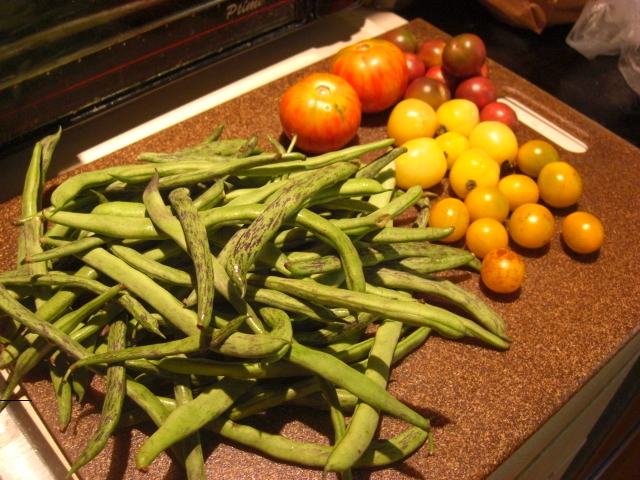 I can’t remember if I like them better than the Romano beans, but I’m looking forward to jogging my memory. 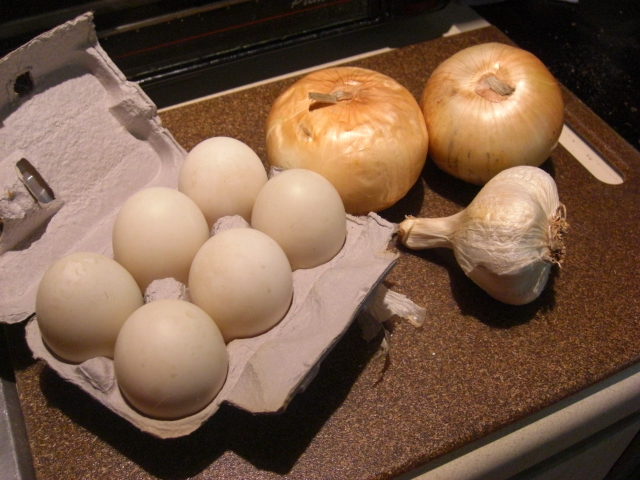 I’ll simmer these slowly with a little olive oil or sausage drippings. Here are some of the combinations I’m thinking about for this week. Here’s a way to use tomatoes and other summer vegetables like squash, zucchini, and eggplant: create a chunky tomato concoction and then use it in a variety of ways. This week, I chopped up tomatoes, patty pan squash, and garlic. Last week, it was tomatoes, onion, zucchini, and a quarter pound of ground beef. 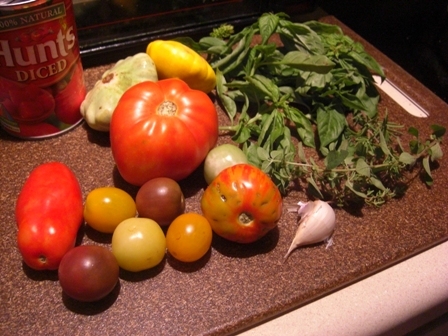 Both times, I’ve thrown in a can of tomatoes to stretch the sauce because tomatoes cook down so much. I also visited Lucy’s herb garden for some thyme, oregano, rosemary, and basil.